Many credit card payments were rejected by Patreon at the start of the month, when payments are collected by creators. You may need to call your bank and retry your payment. If you’re on Patreon, be sure to check your pledges and your billing history to confirm that your payments were processed. Otherwise you may miss out on content, and your creators will miss out on vital payment! Koyama Press will be closing in 2021. Annie Koyama, its founder, plans to focus on direct patronage. This article was really enlightening, and I now have a new hero. Here’s to supporting artists and helping them get what they need! StArt Faire’s last issue has been released. Thank you to Draco, Rebel, and all of its contributors for helping StArt Faire be an amazing monthly webcomic magazine! Project Wonderful has closed. Thank you for the accessible advertising opportunities you provided for webcomic creators! The Mike Wieringo Comic Book Industry Awards (also known as the Ringo Awards) are open for voting by professional comics creators through August 31. The Oregon Book Awards are accepting applications through September 10. Books by Oregon authors with an original publication date between September 1, 2017 and August 31, 2018 are eligible for awards in a number of categories. Mary Safro is currently raising funds for the production of Drugs & Wires Volume 1: Down in a Hole. Drugs & Wires is an ongoing cyberpunk webcomic set in the 90s that follows Dan, a recovering VR junkie, as he lives out his life in the Republic of Stradania. This first volume would collect the first four chapters into a 136-page full color paperback comic. Tier options include digital and physical copies of the volume, digital copies of supplemental comic stories related to Drugs & Wires, postcards, prints, stickers, an enamel pin, a t-shirt, a floppy disk, and original artwork. The Kickstarter ends on August 4. Sweaty Palms is currently raising funds on Kickstarter to produce its second volume. The second volume of Sweaty Palms features over 320 pages of autobiographical comics regarding mental health and anxiety from 45 indie creators. Tier options include digital and physical copies of the book, postcards, stickers, an mp3, a pin, a poster, and original artwork. The Kickstarter ends on August 4. Magical Warrior Diamond Heart, a visual novel otome game, is currently raising funds on Kickstarter to assist its production. The game features up to 7 romantic options with male, female, and nonbinary love interests, 2 friendship options, high-quality voice acting, and an ethnically diverse cast of characters. Tier options include a digital copy of the deluxe version of the game, digital wallpapers, the soundtrack, the artbook, buttons, character sketches, stickers, acrylic charms, a cameo in the game, and more. The Kickstarter ends on August 6. Invisible Illness: Anxiety is currently raising funds on Kickstarter for its production. The comic anthology features over 90 pages of comics, illustrations, and sequential art from over 30 artists that address their experiences with anxiety. Tier options include digital and physical copies of the book, digital wallpapers, digital stickers for Telegram and Discord, stickers, magnets, and original artwork. The Kickstarter ends on August 7. Dirty Diamonds is currently raising funds on Kickstarter to produce its ninth volume of work, Being. The all-girl comic anthology features 224 pages of work by 65 creators whose comics explore the concept of “being” and what it means to exist as a fallible living being. Tier options include digital and physical copies of the book, a behind-the-scenes PDF, bookmarks, an enamel pin, a keychain, a signed bookplate, original artwork, previous Dirty Diamonds anthologies, and more. The Kickstarter ends on August 8. The Starlight City Project is currently raising funds on Kickstarter to produce R:ILPERSONA Volume 1: The Etheric Mastery Edition. To quote the Kickstarter page, “R:ILPERSONA takes place in a post-apocalyptic world 693 years after the world as we know it was destroyed” and follows the character Rade, a teenage assassin who awakes mid-mission with no memories. This volume will collect the first 3 chapters into a 136-page comic book as well as a new prequel chapter. Tier options include digital and physical copies of the book, a digital indie comic bundle, stickers, prints, and the series soundtrack. The Kickstarter ends on August 9. Comic creator Mildred Louis is currently raising funds on Kickstarter to print the second volume of her series Agents of the Realm and reprint the first volume. The series follows four college freshmen who must contend with maintaining their daily lives while also being magical guardians of their realm. Tier options include digital and physical copies of either and/or both volumes, digital wallpapers, stickers, postcards, prints, an enamel pin, a signed bookplate, and more. The Kickstarter ends on August 15. The Nib, a daily comics publication that shares political cartoons, journalistic comics, and memoir comics, is running a Kickstarter to produce The Nib Magazine. The quarterly magazine’s first four issues are planned to be over 100 pages each, with the first one, themed around “death,” ready to send to print. Tier options include phone backgrounds, digital and physical copies of the first four issues, a 20-page activity book, a subscription to In These Times, an Inkwell membership, a tote bag, a coffee mug, additional contributor books, and more. The Kickstarter ends on August 15. Artist Heikala and 3dTotal Publishing are currently raising funds on Kickstarter to produce an artbook of her illustrations and creative process. The hardcover book will feature a comprehensive collection of Heikala’s works as well as insight on her success as a professional artist and tutorials on watercolor painting and product design. Tier options include the physical hardcover book, digital video tutorials, fabric patches, and prints. The Kickstarter ends on August 16. JiMi Agency’s Summer Group Order is now open. Final art files are due August 7. Kymera Press is seeking a social media/PR professional to run social media accounts, write press releases, and mail out books for review. The Comic-Con Professional Application Period for San Diego Comic-Con and Wondercon in Anaheim, CA are accepting applications for 2019 until August 16, 2018. If you make comics or work professionally in an adjacent field, you may receive a complimentary badge! The results of the Webcomics/Indie Comics Reader Survey have been released. Thank you, RebelVampire! (Burbank, CA) Cartoon Network Studios is seeking a Production Manager. (Kilkenny, Ireland) Cartoon Saloon is looking for a compositing supervisor, FX supervisor, storyboard supervisor, and technical lead. (Burbank, California) Disney TV Animation is seeking an art director, a location designer, and a storyboard artist. Be sure to check their website for both creative and office positions with Disney! (Glendale, California) Dreamworks is hiring an Animator, a CFX Artist, a CG Generalist, a Color Stylist, a Modeler, a Visual Development Artist, and much more. (Burbank, California) Nickelodeon is hiring a background painter, a storyboard director, storyboard artists (1) (2) (3), a storyboard revisionist, and more! They’re also accepting applications for internships for Spring 2019. Titmouse is looking for an After Effects compositor and line producer in Los Angeles, CA. They’re also seeking a 2D animator, a background layout artist, a storyboard revisionist, and a lead designer in Vancouver, Canada. The Tokyo Anime Award Festival is accepting entries through October 31 for Short Animation (30 minutes or shorter) and November 10 for Feature Animation (60 minutes or longer). Award recipients may receive up to 500,000 yen. (Burbank, California) Walt Disney Animation Studios is hiring an environment designer and a story artist. You can find a directory of currently open animation jobs at animatedjobs.com. Threadless is accepting artwork for the following design challenges: Shred, due August 3; and Primary Colors, due August 10; and Culture Jamming, due August 17. Dezeen x Samsung’s Ambient Mode Design Competition is accepting submissions through today, August 3. Design a static or animated ambient mode for Samsung’s QLED TVs for a chance to win up to €8,000, with €5,000 or €3,000 awarded to the remaining 14 runners-up. Jenn Arledge is accepting pitches for their upcoming comic anthology My Kingdom for a Panel, inspired by Shakespearean works, through August 10. Accepted contributors will receive $20/page upon Kickstarter success. Proposed comics should be between 2 and 10 pages and in black and white or grayscale. The 2018 Encircle Love Louder Art Benefit is accepting pieces from artists for an art sale benefitting the Encircle LGBTQ+ Family & Youth Resource Centers. Artwork must be submitted by August 15. Artists must agree to donate at least 40% proceeds to Encircle, but may donate more, or keep the rest. DOT Art is seeking artists for their Barrier Beautification Project through August 17. Space Between Entertainment is looking for sequential artists for upcoming projects. Email them with samples of your work by August 20. The Nib’s upcoming quarterly magazine is seeking submissions for its issue themed “Empire.” Pitches for “Empire” are due August 30, and pitches for the next issue on “Scams” are due November 30. The Little Hakka International Picture Book Award is accepting submissions through August 31. Work must have been created or published between January 2015 and August 2018 and should include at least 10 images. There is no fee to enter, and prize winners may receive up to 30,000 RMB. NASA’s Project Mars competition is accepting films and posters regarding space travel to Mars through August 31. Film producers may win up to $10,000 and poster creators may win up to $1500. Elements Anthology is accepting applications from people of color for its newest anthology, “Earth,” through September 2. Contributors will be paid $50/page upon Kickstarter success and will receive 5 softcover copies of the anthology. LINE Webtoon is hosting a “Discover Creator” comic contest with cash prizes of up to $80,000. Submit your comic between June 11 and September 13 for a chance to win. See the rules for details on categories and amount and length of episodes required for qualification. The Asexual is accepting submissions of art and writing for A(gender): An Anthology through September 15. Local Haunts: A Spooky Comic Anthology is accepting applications through September 25. Comics should be between 1-5 pages when completed. Contributors will receive $50 per page if sales goals are met. Upcoming anthology Boricua en la Luna is accepting applications from Puerto Rican writers, illustrators, and comic artists through September 30. Selected contributors will receive a copy of the anthology; otherwise, proceeds will go to the Hispanic Federation. The Silent Manga Audition is accepting comic submissions of 31 pages or less for its 10th contest through September 30. Comics should have the theme(s) of friendship, effort, and/or victory. Cash, Wacom, and Clip Studio Paint prizes will be awarded to winners. Cloudscape Comics’ Life Finds A Way comic anthology project is accepting submissions of proposals and completed scripts through September 30. Accepted contributors will receive $50/page pending Kickstarter success. Proposed comics should be up to 12 pages long and in full color. ABRAMS Calendars is seeking an Associate Art Director and an Editorial Assistant for children’s books, YA books, and graphic novels. (Glendale, CA) Disney Consumer Products and Interactive Media is seeking a lead artist. (San Diego, CA) IDW is seeking an Editor. (Los Angeles, CA) Line Webtoon is seeking an Editor. Are you a comic artist, memoir graphic novelist, or illustrated gift book-maker looking for an agent? Kate McKean is reopening for queries on August 15. (Nottingham, UK) Room 17 Games is seeking a new in-house Artist/Illustrator. Con or Bust has free tickets available for people of color for a number of upcoming conventions, including WorldCon 76, Nine Worlds, GeekGirlCon, the 2019 SFWA Nebula Conference, and more. You may request assistance now through August 10. Conosaurus is LIVE! Browse cons by location, date, and other variables! Check it out and support their Patreon! Here’s their Weekly Digest #63! In partnership with Kickstarter, FlameCon is offering free professional headshots to as many cartoonists at the show as possible. Sign up here by August 10 to be added to the list. ClexaCon is currently accepting applications from artists and exhibitors. The Boston Art Book Faire is accepting applications through today, August 3. TCAF is accepting applications to its 2019 show through October 12. (New York, NY) Bloomsbury Publishing is seeking a Marketing Designer. Chronicle Books is seeking a Designer for Children’s Publishing. (Glendale, CA) Disney Corporate Creative Resources is seeking a Graphic Designer. (New York, NY) Harper Collins is seeking a Senior Designer and an Assistant Designer. Latinx in Publishing is seeking a paid marketing and publicity intern. (New York, NY) Little Brown is seeking a Designer/Senior Designer and a Junior Designer. (New York, NY) Penguin Young Readers is seeking a Designer. Penguin Teen is seeking an Associate Manager of Digital Marketing. (New York, NY) Random House Graphic is seeking a Designer. (New York, NY) Workman Publishing Co. is seeking a Junior Designer in their Children’s Department, a Production Editor, and a Senior Graphic Designer. Looking for more fan zines to submit to? Check out Find Anthologies and ZineAppCalls for more! The 2018 CCF Fellowship for Visual Arts is accepting applications from Los Angeles County Residents through August 31. Applications must be over 25, have at least 5 years of professional experience, and must have been a Los Angeles county resident for at least 5 years. The Hodder Arts Fellowship is accepting applications from “artists and writers of exceptional promise” through September 18. Recipients will receive an $82,000 stipend and will have the academic year at Princeton University to pursue independent projects. The Princeton Arts Fellowship is accepting applications from early-career artists through September 18. Fellows are expected to stay for two consecutive academic years at Princeton University, teach one course per semester, and will receive an $81,000 stipend per year. The Asian American Writers’ workshop is accepting applications from Asian American writers age 30 or under and based in New York City to its 2019 Margins Fellowship. Four selected applicants will receive $5,000, residency time at the Millay Colony for the Arts, mentorship, access to the AAWW writing space, and publication opportunities in online magazine The Margins. Applications must be submitted by September 12 for consideration. (Atlanta, GA) Sulphur Studios is accepting applications for three different four-week residency periods in the fall. Apply by August 15 for consideration. Accepted artists receive 24-hour access to the studio space for free, but must place a $100 deposit upon arrival, to be returned at the end of the residency. There is a $25 application fee. Red Bull Arts Detroit is accepting applications for their 3-month residency program through August 24. (Breckenridge, CO) The 2019 Artist-in-Residence Program at Breckenridge Creative Arts is accepting applications from visiting, local, and exhibiting artists through August 31. Visiting artists will be reimbursed up to $500 for travel and will receive a stipend of $200 per week. They will be expected to mentor a local artist, facilitate a weekly class, take part in a public showcase, and host a final presentation with a local collaborator. The Washington Award is accepting applications from artists in the fields of dance, music, or the visual arts through today, August 3. Recipients will receive $10,000 with a chance to win an additional $5000. GLAAD is accepting applications for its 2018 Rising Stars Grant through August 22. Applicants must be between 18 and 30 years old and use social media, digital media, and/or technology to enhance the experience of LGBTQ people in their communities. Grant recipients will receive $2500 and be honored at the GLAAD Gala in San Francisco, with travel and accommodations paid for. The Author Accelerator Diverse Voices Scholarship is accepting applications from unagented writers of color through August 31. Three recipients will be selected to receive two back-to-back Manuscript Accelerator Coaching programs and career mentorship beginning in January 2019. The Comics for Community, Compassion, and Culture, or C4C3, Grant is open for applications from teachers, librarians, and educators who use comics to teach through August 31. The Sustainable Arts Foundation is offering 20 grants of $5000 each to artists and writers from anywhere in the world with children under 18. Apply by August 31 for consideration. The National Association of Latino Arts and Cultures (NALAC) is accepting grant applications from Latinx artists, art organizations, mentors, or ensembles through September 6. Fireside Fiction is open for submissions of novels or novellas of any genre through August 31. Bedside Press is accepting pitches from Indigenous (particularly two-spirit/queer) writers for Love After the End. Pitches will be accepted through September 1. Less Than Three Press is seeking apocalyptic/post-apocalyptic/pastoral apocalyptic LGBTQIA+ stories between 8000 and 15,000 words by September 30 for their upcoming anthology Life After All. They are also open to general submissions. ABRAMS Books is seeking an Executive Editor for Childrens’ Books and an Editorial Assistant for children’s books, YA books, and graphic novels. Anathema is seeking fiction and nonfiction from queer nonwhite writers. (New York, NY) HarperCollins Publishing is seeking an Assistant Editor for the William Morrow and Harper Voyager imprints. (New York, NY) Melcher Media is seeking a Book Editor for illustrated books. (New York, NY) New York University Press is seeking an Editorial Assistant. (New York, NY) Penguin Random House US is seeking an Associate Production Editor. ReadySet is looking for an Assistant Editor. Remote is okay, with applicants local to Los Angeles preferred. (New York, NY) Sourcebooks Fire is seeking a Senior Editor for teen fiction. (New York, NY) Workman Publishing Co. is seeking a Children’s Editorial Assistant and a Production Editor. The Food and Agricultural Organization of the United Nations is accepting submissions from artists ages 5-19 for the World Food Day 2018 Poster Contest through November 9. Create a poster that illustrates the idea of “Zero Hunger” for a chance to win a Certificate of Recognition, a gift bag, and the opportunity to be featured in an exhibit. (Portland, OR) Miss Anthology is hosting free comic workshops this summer in for youth ages 9-18. Barbie gave out some good advice on the sorry reflex. Thanks Barbie!! It takes practice to unlearn the sorry reflex, but it’s worth it for your mental health and also for those around you. Becca Hillburn of Nattosoup shared a post on Budget Watercolor Recommendations and a guest blog from Kabocha on Foiling with a Laminator. Be sure to check Becca’s Youtube channel for new video interviews with independent artists, walkthroughs with dip pen nibs, tutorials, and more. Catapult shared advice on finding agents and pitching your books. Author Debbie Ohi shared free templates, resources, and how-to guides for Creating Children’s Books. The Freelancer’s Union posted The Freelancer’s Guide to Getting Paid on Time. Check it out! Jen Bartel shared great tips and things to keep in mind when approaching artists at conventions for portfolio advice. Jesse Hamm shared 10 ways to save time while making comics! These are incredible tips, and as the “slowest artist ever,” I look forward to using them. Thanks Jesse! Kabocha added new Clip Studio Paint brushes to their site along with new Photoshop patterns and watercolor papers on Gumroad. Riana Dorsey gave some great tips on lighting and shading! Thank you, Riana! The entire Adobe Creative Suite is on sale for $30/month for the first 12 months. It’s usually $53/month for that plan, so this is an incredible deal. Bodies in Motion has its subscriptions available for 50% off. Every Monday, Barnes and Noble offers deals on manga. They are also having a Buy 2 Get 1 Free sale on Viz manga titles through August 4! Be sure to check it out! Schoolism is offering $100 off an annual subscription through today, August 3. Goodreads constantly offers giveaways for a variety of titles in all genres. Check out these giveaways for comics and graphic novels, like this one for Hocus & Pocus: The Legend of Grimm’s Woods and Tillie Walden’s On A Sunbeam. Seven Seas has a survey for July. Fill out the survey to be entered into a raffle to win a copy of any book Seven Seas has published so far in 2018! SMAC, the Silent Manga Audition, has a survey open for manga readers. Fill it out by August 5 for a chance to win a Playstation 4, original artwork from Jun Tomizawa, copics, Japanese snacks, and more. Sparkler Monthly is hosting a survey for June. Fill it out for a chance to win a Sparkler paperback of your choice! Unbound Worlds, in partnership with Threadless, Thrilist, and Shudder, is giving away a trip for two to New York Comic Con, along with a $1000 travel stipend and other gifts. The giveaway closes on August 15. It’s not a “true” giveaway, but: The Comic Con Museum is accepting donations starting at $10 and in exchange is offering the chance to win yourself and a friend 4-day passes to San Diego Comic-Con with preview night, reserved seating in Hall H, and complimentary travel and stay. Donate by October 18 for a chance to win. If you enjoy the Weekly Roundup, please consider supporting me through my Paypal or Ko-Fi. 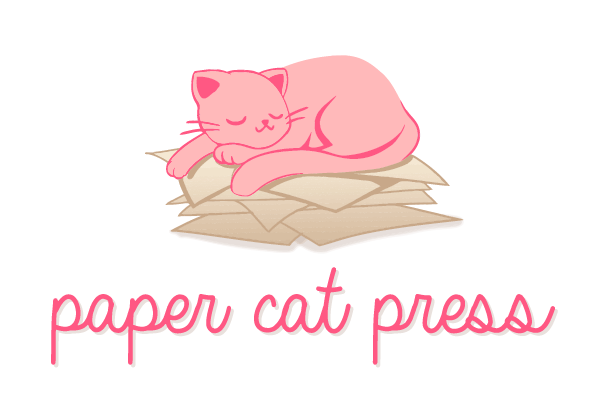 Thank you to Atla, comicops, and Toronto Comix for sharing Paper Cat! And hello to the new followers out there – I hope this resource helps you!